Regardless of whether a culture is oral or literate, both cultures are able to learn and the ways in which they learn are similar based on identical learning theories. Ong’s characteristics of thought and expression pertain to the cognitivism and constructivism learning theories. Although people have depended more on print for their learning during the past four centuries, people can still learn by using the means that oral cultures did in the past. Ong’s characteristics of thought and expression conform to the cognitivism and constructivism learning theories that describe some of the ways that both oral and literate cultures learn. Clark, R. C., & Mayer, R. E. (2008). e-Learning and the Science of Instruction: Pfeiffer San Francisco. As a typographic culture (and becoming more so a Web 2.0 culture), we take for granted the power that writing has on our everyday existence. Neil Postman (1992) in his book, “Technopoly: The Surrender of Culture to Technology” asks us to consider both the “burden and blessing” that technology holds within our lives. To examine writing as a technology, Postman refers to Plato’s Phaedrus whereby King Thamas is opposed to sharing the new technology of writing as he fears that it will be detrimental to his people. Although Postman argues that we should not be as one sided as King Thamas, I find that his position is sceptical and often Luddite in nature. That being said, I feel that Postman’s “Technopoly” offers numerous points for further reflection. “The words technical change have come to symbolize for people all over the world a hope that is new to mankind” (Mead, 1955, p.1). Postman shares that Plato’s Theuth shared a similar interest to Mead of spreading the new technology of writing to the masses. Many see technical change as a means to add to a cultures knowledge base and should be widely distributed. I also think that we should take what we know and better ourselves with new techniques and technologies. Postman on the other hand cautions that a “new technology does not add or subtract something. It changes everything” (p. 18). I don’t agree with Postman that new technology can change everything as I feel it needs to be proven valuable and useful first. An example of this is the perseverance of Sidney Pressey to revolutionize teaching with his “Automatic Teacher” machine (Petrina, 2004). Pressey’s goal was to create a new technology that would free teachers from mechanical tasks so they could spend more time with individual students (Petrina). While the intentions were admirable, both the technology did not live up to its standards and the culture of teaching was not agreeable to machines as teaching aids. The teachers in Pressey’s time did not believe that this technical change was a blessing to them as thus Pressey’s “Automatic Teacher” was never widely adopted. Similar sentiments were felt when writing was the new technology and people opposed its adoption. Ong (1982) shares the story of A.L. Luria who did fieldwork with literate and illiterate people in rural Uzbekistan in 1931. Luria found that “it takes only a moderate degree of literacy to make a tremendous difference in thought processes” (p. 50). Both Ong and Postman agree that those that are in control of knowledge have power. Postman cautions that this elite group have been “granted undeserved authority and prestige by those who have no such competence” (p. 9). Postman makes an excellent point of “underserved wisdom” and I would argue that this is reflected with what is taking place in today’s classroom. There are teachers, administrators and parents that believe that using new technology in the classroom is of paramount importance and thus, those who use it are applauded and those who refrain from adoption are seen as obsolete. I would agree with Postman that there are “winners and losers” in the knowledge monopoly. The technological knowledge gap that exists within a school creates a burden on teachers. As someone from a literate cultural circle it is hard to understand the struggle that occurred as writing was the new technology and was gaining popularity. Postman urges us to examine the introduction of computers into the classroom as he feels they will alter they way in which we teach and learn. Postman describes how King Thamus believed that communication and instruction were tied to orality. He argues that orality stresses group learning and cooperation whereby print learning focuses on individualization and competition. Ong would agree with Postman in that he feels that orality creates unity and “writing and print isolate” (p. 73). Both Postman and Ong wrote in a time that differs from now: widespread adoption of computers in classrooms is inevitable. I consider the points that both make and I would agree to some, but I would argue that an evolution has taken place and that computers are being used to increase collaboration and improve overall learning among students. Web 2.0 has taken hold and wiki’s and community weblogs are being implemented into classrooms and are facilitating cooperation and collaboration among students. The successes of Learning Management Systems, such as Moodle, are built on the premise of social constructionist beliefs whereby knowledge is created by the expertise of the group (Moodle). Moodle. (2009) Retrieved September 27, 2009 from http://docs.moodle.org/en/About_Moodle. Petrina, S. (2004). Sidney Pressey and the automation of education, 1924-1934. Technology and Culture, 45(2), 305-330. The action of one who writes, in various senses; the penning or forming of letters or words; the using of written characters for purposes of record, transmission of ideas, etc. Style, form, or method of fashioning letters or other conventional signs (esp. in handwriting or penmanship); the ‘hand’ of a particular person. Wording or lettering scored, engraved, or impressed on a surface; an inscription. When first reading these definitions, they seem to convey what is typically thought of when defining the term writing. However, with more reflection, it becomes clear that each is in some way limited, either in its description of what writing may have been for a society thousands of years ago, how writing is currently being done, or how we may write in the future. Thousands of years ago, humans were using various methods to satisfy their “fundamental need to store information in order to communicate, whether to themselves or to others, at a distance in time or space”(Ong, 1982, p.11). To achieve this storage of information, some of the oldest and most common methods used were knot records, notches and tallies. Knot records, in particular those used by the Inca of Peru, were complex and elaborate methods of recording transactions and payments. These systems of adding and removing strings, allowed for categorical variety and a high level of complexity while recording numbers and prompting memory. Pictography was also widely used many thousands of years ago as a way of conveying even larger varieties of information and more complicated messages. All of these methods were used to transmit and communicate ideas and information to others beyond the immediate present. These, and many others, have been used for years to aid memory, store information and convey human thought and/or speech over distances, thus contributing towards the “repertoire of resources that would eventually yield complete writing.” (Fischer, 2001). The three definitions of writing previously mentioned do not encompass these methods, however, I believe that we must not view these developments as ‘limited’ writing, but as a usable form of writing and communication for the society in which they were developed. The way we store and communicate information has developed, progressed and drastically changed over the years. For hundreds of years writing was as typically defined: the forming of written characters on a durable surface. However, we are now living in a digital and technological age, where more and more writing is done on the computer, and in many cases stored on the Internet. It is evident that we must rethink our traditional definitions of writing, in particular that it must produce marks on a durable surface. Wiki pages are now a main means of retrieving and storing information. Anyone, from anywhere in the world, can contribute, edit and access the information stored on these Internet pages. Since this community page allows such open access, we are effectively choosing as a society what we feel is the important knowledge to store and share. The way a society currently communicates and stores information, be it on rock, on paper or in a computer, is a reflection of what has been created and what is available at that present time. As technology, and the availability of technology, changes, so will the method of writing. Chandler (1994) lists various characteristics and features of the written word, including (but not limited to) the following: visual, external, fixed, ordered, objective, quantifying, abstract, detached, individual. These terms help to describe a more flexible definition of writing. In conclusion, a more encompassing definition of writing could be: “The communication and storage of information for the purpose of access, by oneself or others, immediately or at a later time, in a form that is useful and purposeful for the current society”. Fischer, Steven Roger. (2001). 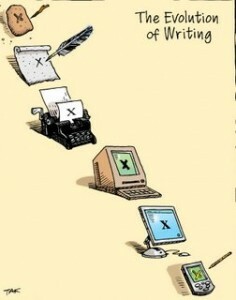 A history of writing. London: Reaktion Books. Gaur, Albertine. (1992). A history of writing (revised edition). London: Cross River Press.